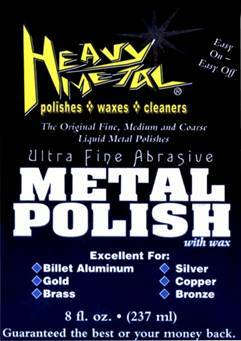 Heavy Metal Ultra Fine Abrasive Polish is recommended for polishing and maintaining smooth oxidized metals. 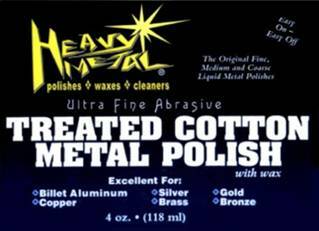 Heavy Metal Ultra Fine Abrasive Polish removes light corrosion, oxidation, tar, rust, stains and tarnish from smooth aluminum, bronze, brass, copper, chrome and other harder metals. Can be safely used on solid silver and gold. Available in 8oz, and 16oz bottles. Heavy Metal Medium Abrasive Polish is recommended for polishing and maintaining harder metals like stainless steel, chrome, nickel or magnesium. 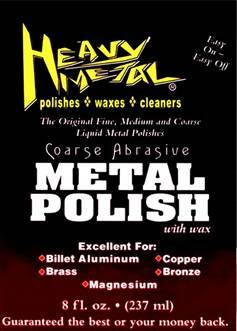 Heavy Metal Medium Abrasive Polish will also tackle medium corrosion, oxidation, tar, rust, stains and tarnish on aluminum, brass, copper and bronze with the greatest of ease. Heavy Metal Coarse Abrasive Polish is recommended for use as a stripping and smoothing agent on heavily oxidized or corroded on all non-plated metals. Heavy Metal Coarse Abrasive Polish functions in a similar manner to liquid sand paper and should be followed by our Heavy Metal Medium Abrasive or Heavy Metal Ultra Fine Abrasive formula polishes to achieve a brilliant shine. DO NOT use on mirror stainless, chrome, nickel, or any other plated metals. 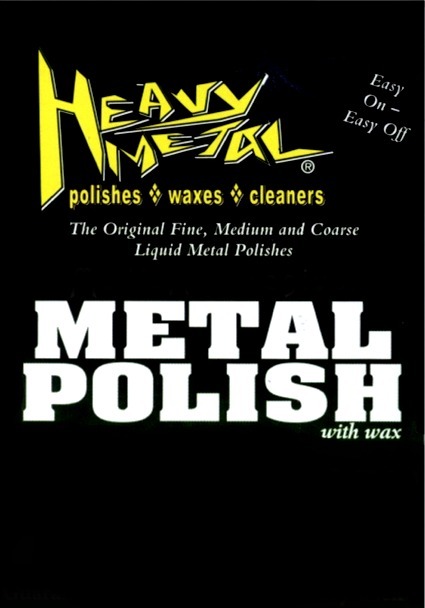 This is the same Heavy Metal Ultra Fine Abrasive Polish in a treated cotton form for those quick jobs you want done fast. 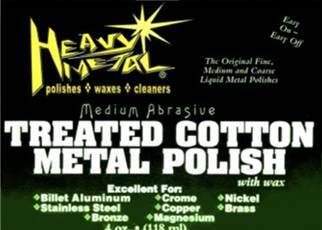 This is the same Heavy Metal Medium Abrasive Polish in a treated cotton form for those quick jobs you want done fast. 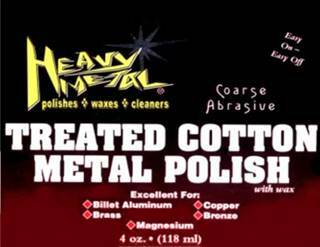 This is the same Heavy Metal Coarse Abrasive Polish in a treated cotton form for those quick jobs you want done fast.